Ransomes Mastiff walk-behind mowers and Jacobsen Tri-King ride-on triples are being used to maintain stadium pitches and training facilities at the FIFA World Cup in Brazil. 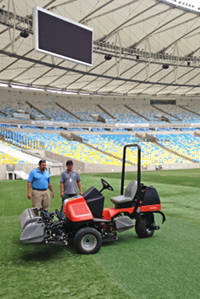 The most prestigious venue at the tournament, the Maracana stadium in Rio de Janiero, which will host the final of the competition, is being mown with both types of mower, although the Mastiff will be used for match day preparation. The other venues using Ransomes Jacobsen equipment are Arena de Baixada in Curitiba, which hosts Australia’s final Group B game against Spain on June 23, Arena de Sao Paulo, Arena Pernambuco in Recife and Estadio Mineirao in Belo Horizonte. Jacobsen Tri-King mowers are also being used at several training venues including the Australian training camp at Vitoria in Espirito Santo, Portugal’s training centre at Campinas at Sao Paulo and Mexico, who are using the training facilities of Santos, again in Sao Paulo. “The FIFA World Cup is the biggest single-event sporting competition in the world and once again, mowers manufactured by our businesses in the UK and USA are being used at this global sporting event.